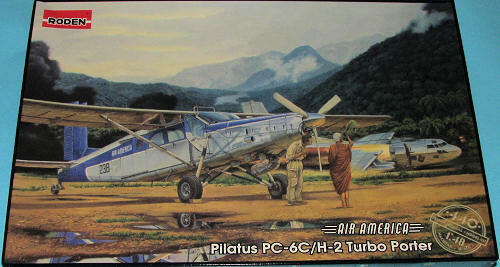 The PC-6C is exactly the same aircraft as the Fairchild AU-23A Peacemaker, though without the armament. It was widely used by Air America as a light utility transport. Here is the second boxing of this particular kit and it is not much of a surprise that it is basically the same as the AU-23 kit. The major difference is that the weapons and pylon sprues are gone and in their place are a pair of sprues that have cabin seats. Molded in grey plastic, there are nine total sprues, all of them with very nice surface detailing. Two of them are duplicated (the one with the seats and the one with the wheels) and one is clear. I found some flash on parts as well as sink areas on the ones that are really thick. A few were also suffering from mold misalignment (notably the control sticks), and anything of any size had ejector pin marks or towers on one side. This means that a few parts (like the doors) will need some additional attention. The cockpit and cabin areas are nicely detailed with the cockpit being well appointed with seats that are more 'solid' than what was with the AU-23, control sticks, rudder pedals and so on. The cabin has four of the more open seats that were used for cockpit seats in the AU-23 kit. This particular version does not have a sliding door on both sides, so on the left there are two hinged doors that open outwards from the center. These parts were on the previous kit but not to be used. There are separate elevators, ailerons and flaps. However, these are to be constructed in the neutral position otherwise the various actuating rods won't fit. There is a separate lower fuselage section on which the landing gear will be attached. Not sure why this wasn't part of the fuselage halves, but there you have it. Of course, the engine assembly is separate to the rest of the airframe and is to be attached near the end of construction. Instructions are well done with color references in FS 595, Testors Acrylic and Testors Model Master references. The instructions also have two diagrams to show where to drill various holes for the antennas and such. None of these holes are started so the measurements are quite exact as to placement. 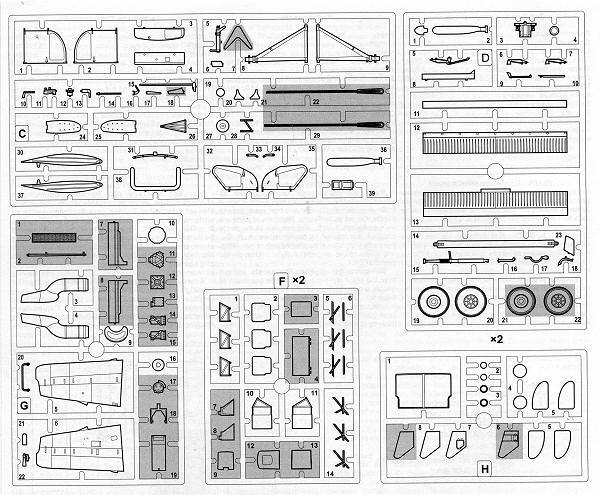 When I built the AU-23, I copied the diagram to size and placed it on the fuselage top, drilling through the areas marked. It worked very well. Markings are provided for three planes all painted in overall silver with blue trim. The blue trim is supplied as decals. One is from the movie 'Air America' while the other two are actual aircraft used in the 1971-74 time period. The decals are fairly well printed. Roden decals have a checkered history in terms of silvering and resistance to setting solutions. It is doubtful that aftermarket ones will be produced for this scheme. I like that Roden has decided to do this series. One can only hope that they will eventually produce other versions of the Pilatus. The AU-23 I built required careful building, but turned out quite well. I'm' sure this one will be the same.